This is unbelievable! PBS is viewed by children! Now this station is being used to brainwash our youth? How? Why? How did they pick it up? Who's decision was it to broadcast this lie? I have always given to our local PBS station but so help me if this is aired I will never give them another red cent! Who can I call or write? This is disgusting. Yes, unbelievable it is. 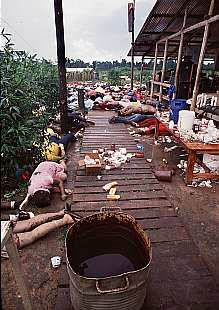 But once again, the proof positive that the powers-that-be want us "condemned" to repeat history, because they refuse to heed its lessons--per the instructions of that forboding sign in the Jonestown Pavillion. Go to the PBS website, which is: www.pbs.org Then find the feedback section and tell it to them! This is, after all, OUR public station, isn't it? And ladies and gentlemen, if Getler or the PBS brass give you the run around--THEN DON'T GIVE THESE CULT APOLOGIST FILM PROMOTERS ANOTHER RED CENT WHEN THEY COME BEGGING. A million thanks. This is first on my to-do list tomorrow! I have contacted the PBS. Lets see if it does any good. http://watchpaul.blogspot.com/ Alot of discussion is going on in regards to this blog on Rose's "Watch Paul" blog. Paul Gallegos is the County of Humboldts DA who hired Tim Stoen as this county's first ADA. Stoen is gone but not until after he wrecked havoc in our county. Gallegos is still here. I am hoping he resigns. 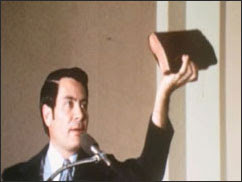 He is no better then Stoen or Jim Jones.